As the heading says, nebulae can be some of the most beautiful things in the Universe, despite being comprised of just dust and gas. There are going to be some fine images on this page! The gases involved (mainly hydrogen and helium) have been ionized by the object at their centre - usually a massive star - giving off ultraviolet radiation. To illustrate what "ionized" means, the neon gas in a street light is ionized by high voltage electricity, causing it to glow. A similar effect occurs with the gases within a nebula, causing it to glow too, producing a sometimes breathtaking result. There are two basic types of these objects: diffuse and planetary. These produce the massive central star necessary to ionize the surroundings by the gravitational collapse of the original gas cloud. They can also result from a supernova explosion, where the energy output is sufficient to cause ionization. 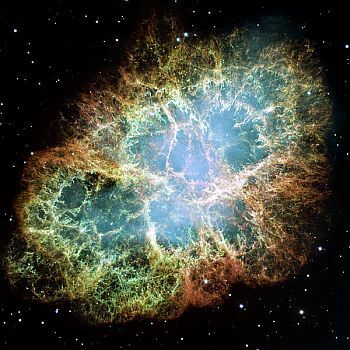 The Crab, pictured here, is an example of one formed from a supernova. These objects, on the other hand, result from the mechanism of a red giant star nearing the end of its life. It is pulsating continuously and this, together with strong stellar winds, caused its surface layer to be ejected, forming the glowing gas cloud. They are very short lived, in astronomical terms - only a few tens of thousands of years. It is also comparatively rare that they are spherical. Far more have irregular shapes and the reason for this is not known. "Planetary", as a description for these phenomena, is not really accurate. It was coined in the 1780s by astronomer William Herschel because, through his telescope, they looked to him like newly forming planetary systems. Even though that has since been shown to be false, astronomers have stuck with the name. 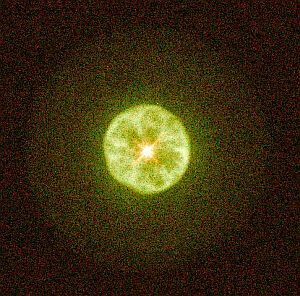 The Cat's Eye, also known as NGC 6543, is found in the constellation Draco, about 3,300 light years away. 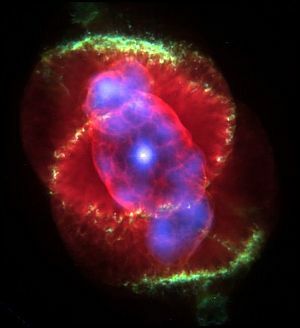 What is notable about it is that it has the most complex structure of any nebula. The Hubble Space Telescope image, pictured here, revealed all manner of features, such as gas jets, arcs of matter and even gigantic bubbles. Also, there were found to be faint concentric circles surrounding the central eye and how they came to be formed is unclear. 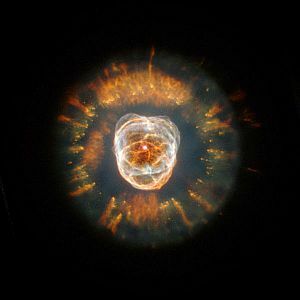 The Eskimo, also known as the Clownface, or Caldwell 39 and designated NGC 2392, lies over 2,870 light years away. It is called the Eskimo because it sort of resembles a face, surrounded by the hood of a parka. The "fur" part of this hood actually consists of light filaments around one light year in length. These are very unusual features. The Lemon Slice is about 4,500 light years away, in the constellation Camelopardalis. Designated IC 3568, it is quite young, only having expanded to just under half a light year in diameter. Almost perfectly spherical, it has been generated by the very hot and bright red giant star at its centre. The famous Horsehead is an example of a dark nebula. Also known as Barnard 33, it lies about 1,500 light years away, in the constellation Orion. Its actual position in the sky is just south of the easternmost star in Orion's Belt. It is dark because it is composed mainly of thick dust. Behind it is a huge bright cloud of ionized hydrogen, giving its silhouette such a striking appearance. 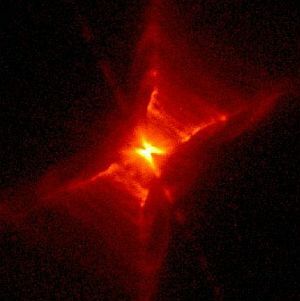 The Red Rectangle is an example of a protoplanetary nebula. Also designated HD 44179, it is found in the constellation Monoceros and was only discovered in 1973. This is an intermediate phase between the death of a star and its subsequent evolution into a fully-fledged nebula. It is thought that, at its centre, is a close binary star system. It has been theorised that these stars are surrounded by a doughnut-shaped cloud of dust, which affect the outpouring of matter, causing the "X" shape. This Messier object merits its own section on this page, because it has been studied and photographed in exquisite detail. 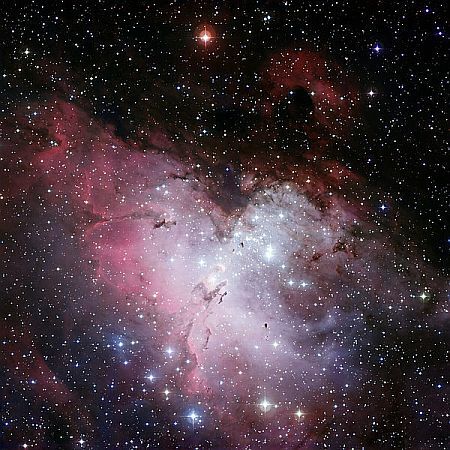 At the greatest scale, as in the above image, it is an eagle-shaped emission nebula, lying some 7,000 light years away, in the direction of the constellation Serpens. Also designated M16, it is about 20 light years across. 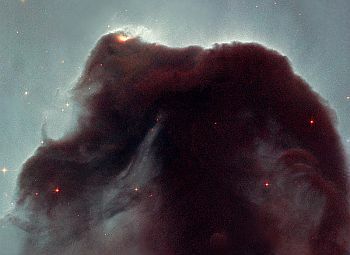 Closer examination shows that the main dust cloud has, at its centre a sort of window leading to a darker area of dust where stars are forming as an open cluster. The mechanism involved has resulted in huge towers of colder dust, gradually being eroded away by the light emission and stellar winds of the young, newly-formed blue stars. This magnificent - and famous - image, by the Hubble Space Telescope, of the so-called "Pillars of Creation" shows huge areas of cool molecular hydrogen and dust that are in the process of forming new stars. The largest one is four light years tall. There is a theory that these pillars have actually been destroyed by a supernova 6,000 years ago. Because of the distance away, light from this event hasn't had time to reach us yet, so humans won't be able to witness it until 1,000 years from now. This striking feature is known as the "stellar spire", or nicknamed the "Fairy". It is an example of the erosion continuously taking place by new stars. 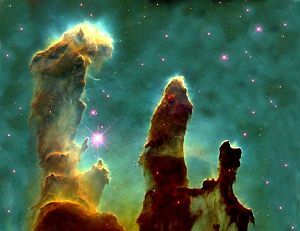 An impressive 10 light years tall, it is spewing out extremely hot radiation and will eventually evaporate completely.